Good Monday to you all. I can't stay long today I thinking I've got something called reading and math homework to do. But I did find out that I'll be getting my computer back soon so hopefully I can pick it up again. For today I am going to talk a little about two recent articles I've read. The first, found here, is about ZAAZ. ZAAZ is a web-agency, excuse me a full service web-agency. They were awarded the Communication Arts "Interactive Annual 13" for their design of Converse.com. The Communication Arts Interactive Design Competition is known as the most prestigious design competition for interactive media. You can read more about it in the article, but I found this to be pretty interesting. I like the Converse site, it's pretty easy to navigate and find what you're looking for. I got to looking and ZAAZ does the websites for Nike, Sony, Starbucks, Microsoft, eBay, Ford, and Cingular just to name a few. For them to get an award for the Converse site when they have a roster as impressive as the one above, now that's pretty tight. The second article is about Liquefied Natural Gas. If you're like me, or even if you're not, chances are you've never heard of liquefied natural gas. Well someone actually has heard of liquefied natural gas, and I am not talking about the liquefied natural gas people. It was recently announced that Nike and Converse will be switching a significant portion of their Los Angeles area harbor drayage fleet from diesel to new Liquefied Natural Gas (LNG) fueled vehicles. Nike estimates the new LNG trucks will emit 18 percent less CO2, 88 percent less NOx and 96 percent less particulate matter per mile when compared to their diesel counterparts. Pretty cool stuff here, I don't understand most of the science behind it though, you can read the rest of the article here. 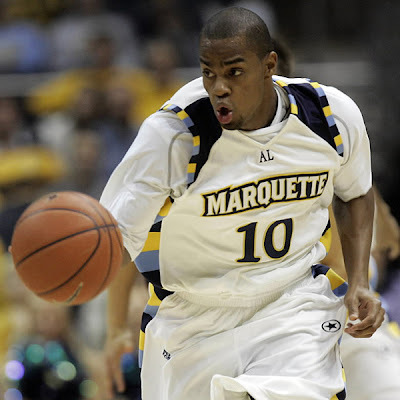 I hated to no have any pictures on here, so I'll leave you with a shot of the Converse clad Marquette in action. Thanks for checking out the blog, keep coming back and leaving comments and all that good stuff.